For Jaz Kuru, working in the forest is in her blood. She started out with Kuru Contracting in Gisbourne, her parents’ business, when she was just 16 years old. Since then she has completed her Modern Apprenticeship in Log Making, the National Certificate in Occupational Health and Safety (Level 3) and the Level 4 Forest Operations Advanced Mechanised Processing programme. 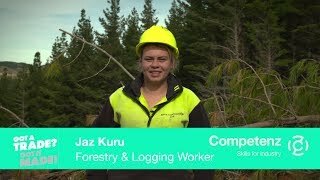 In 2016 she was named Apprentice of the Year at the Eastland Wood Council Forestry Awards. “I left school in 2012, and was unsure what the future had in store for me. I received a pair of orange spiked forestry gumboots for my 16th birthday and decided to try working for the family business. I was so nervous and excited I didn’t know what to expect. I was a little bit apprehensive at first as I wanted to be in the police force, but after a couple of weeks in the bush, I realised that my heart was set for the forestry industry. "When l met Cliff Stoddart from Competenz, he explained to me how an apprenticeship worked, and l signed up. It’s not easy being a young woman in the forest, surrounded by men, and being the boss’s daughter, I felt l had a lot to prove. When asked what advice she would give to her 16-year-old self, Jaz says: “I wouldn’t change a thing. I have been proudly following in the footsteps of my dad and poppa. I am the foreman and health and safety officer at my company, which means I am here to protect my workers.